1-6 If the love of life causes earnest pleadings with those that can only kill the body, how fervent should our prayers be to Him, who is able to destroy both body and soul in hell! How should we pray for the salvation of our relatives, friends, and all around us! When we petition great men, we must be cautious not to give them offence; even just complaints must often be kept back. But when we approach the King of kings with reverence, we cannot ask or expect too much. Though nothing but wrath be our due, God is able and willing to do exceeding abundantly, even beyond all we can ask or think. 7-10 The king was angry: those that do things with self-will, reflect upon them afterward with self-reproach. When angry, we should pause before we come to any resolution, and thus rule our own spirits, and show that we are governed by reason. Those that are most haughty and insolent when in power and prosperity, commonly, like Haman, are the most abject and poor-spirited when brought down. The day is coming when those that hate and persecute God's chosen ones, would gladly be beholden to them. The king returns yet more angry against Haman. Those about him were ready to put his wrath into execution. How little can proud men be sure of the interest they think they have! The enemies of God's church have often been thus taken in their own craftiness. The Lord is known by such judgments. Then was the king's wrath pacified, and not till then. And who pities Haman hanged on his own gallows? who does not rather rejoice in the Divine righteousness displayed in the destruction his own art brought upon him? Let the workers of iniquity tremble, turn to the Lord, and seek pardon through the blood of Jesus. Verse 9: The evil that Haman had in mind for Mordecai came back upon his own head. Esther was under the tent of Mordecai to become great who,s tent are you? God did judge Haman - through the king. Just as He used a Persian king, Cyrus, to help His people rebuild the temple. The king could have let go of Haman and let God judge him instead. God will always be sovereign! I see your enemies swallowing their evil deeds and falling into the pit they dug for you in Jesus' name. Evil shall not prevail. What the devil means for evil God will turn it for Good. The one who dig a pit for others to fall into it is the one who will fall into it, God knows everything even the things in our hearts. We see the same actions occurring today against Christians in the world. Jesus says, "Fear not, for redemption drawest near. What Do You Think of Esther 7? 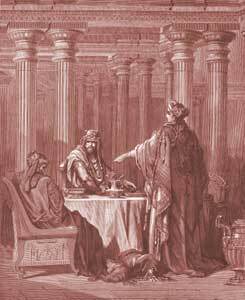 What happened to Haman after King Ahasuerus (Xerxes) found out he was plotting against Esther and the Jews?